The AATVM contains maps of several geobotanical themes covering the tundra region of Alaska. The map was derived from the Circumpolar Arctic Vegetation Map (CAVM) and was published at 1:4 million scale (Raynolds et al. 2006). 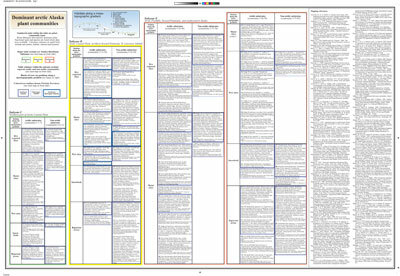 A description of the methods used to make the map is in Raynolds et al. 2005. Most of the mapped themes are subsets of those portrayed on the CAVM; only the vegetation theme is different, displaying 33 map units instead of the 13 units portrayed on the CAVM. See the detailed map description for more information about the map unit colors and coding, plant communities, and mapping process. The detailed plant community description has more information about naming conventions, tabular organization of the descriptions, and the information that is included in the descriptions. Raynolds MA, Walker DA and Maier HA. 2006. Alaska Arctic Tundra Vegetation Map. Scale 1:4,000,000. 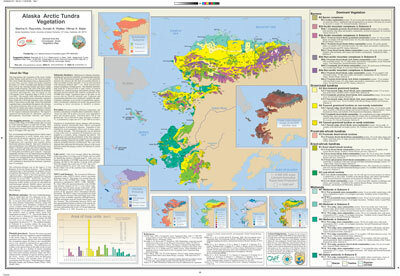 Conservation of Arctic Flora and Fauna (CAFF) Map No. 2, U.S. Fish and Wildlife Service, Anchorage, Alaska. ISBN-13: 978-0-9767525-1-6; ISBN-10: 0-9767525-1-4. Contact the Geophysical Institute Map Office (907.474.6960), on the University of Alaska Fairbanks campus. Map is printed on glossy paper, $9.00.